After more than a three-week delay, commercial crab fishermen will begin dropping their nets this Saturday in coastal waters from Bodega Head north to the Sonoma-Mendocino county line. The region was slated to open Nov. 15 but was postponed due to unsafe levels of toxic domoic acid found in crabs. Points south of the Sonoma County coastline opened on schedule last month. Commercial crabbing further north remains closed until at least Dec. 15; dangerous levels of the neurotoxin in crabs continue to be a problem in waters off Trinidad and Crescent City. Domoic acid issues have plagued California’s Dungeness crab industry in recent years. 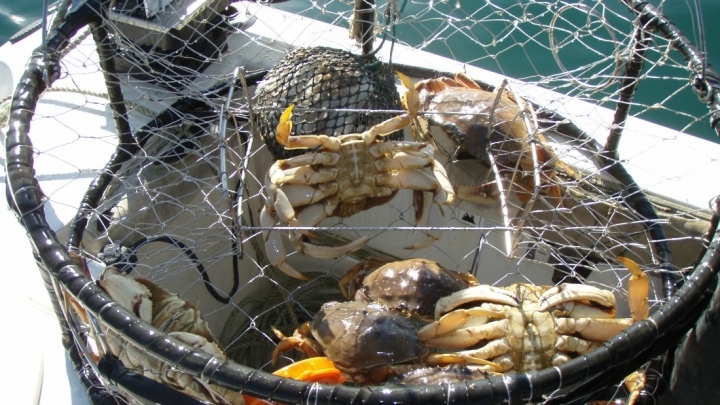 Every season dating back to the catastrophic 2015-16 season has dealt with closures to at least some portion of the fishery, with resulting economic fallout for commercial crab fishermen. A group of fishermen now seeks damages from the oil industry for contributing to the cause of these toxic acid spikes. Domoic acid buildup is a byproduct of harmful algal blooms created by warmer ocean temperatures, which can be exacerbated by climate change. Last month, attorneys representing the Pacific Coast Federation of Fishermen’s Associations filed a lawsuit against a long list of oil companies, including Chevron, ExxonMobil, Shell and BP. The suit claims that the fossil fuel industry knowingly produces "greenhouse gas pollution that warms the planet, changes our climate, and disrupts the oceans." Noah Oppenheim, executive director of the PCFFA, says that Dungeness crab fishermen have lost tens of millions in revenue as a result. "We are going to be dealing with the impacts of climate change for a very long time in California commercial fisheries," Oppenheim said. "And we need to hold the organizations and companies that caused this problem to account." Sean Comey, a spokesman for Chevron, says the action is without merit. "The suit seeks to penalize the production of reliable, affordable energy, which has for decades been not only lawful, but actively encouraged by governments," Comey said. According to Comey, Chevron is committed to finding "real solutions" for climate change, and this type of litigation is "counterproductive." Larry Collins is a crab boat owner based out of Fisherman's Wharf in San Francisco. Collins, a 30-year veteran of commercial fishing, started crabbing after witnessing the decline of salmon in California's waters. He's now seeing his livelihood threatened once again. "You used to be able to depend on the opening of crab season like clockwork," Collins says. "It sure doesn't feel that way anymore." Collins, who serves as president of the San Francisco Crab Boat Owners Association, says many of the younger, less-established fisherman he's met haven't been able sustain the fallout of the last three seasons. While Collins is happy the 2018 season is opening without too many delays, he says there's still a lot of uncertainty surrounding the industry. "It's really hard to know what to do," he said. For people concerned about getting sick from eating Dungeness crab, Noah Oppenheim stresses that it is safe to consume the crab you find in fish markets and grocery stores, provided it's sourced from California or Oregon. “You should get your crab wherever you can find it,” he said. “If it’s on the market, it’s safe."